Uber's leaked financial reports from 2012 to 2014 have spurred a polarized debate on late stage valuations. Optimists have pointed to Uber's strong revenue growth as a sign of business model validation. Meanwhile, skeptics latched onto the fact that the company's losses ballooned to hundreds of millions of dollars even as its valuation exploded. Both are strong, but incomplete, arguments because they lack a frame of reference. Uber's revenue growth does appear strong, but how does it compare with those of previous IPO stars? Are Uber's steep operating losses consistent with successful companies that preceded it? And what do these comparisons mean? These are the questions I hope to tackle in this post. Let's begin with Uber's own financials. The leaked financial reports were very informative, but they did have a few holes. The reports cover quarterly financials from Q1 2012 to Q2 2013 and Q1 2014 to Q2 2014. They also included full year financials for 2013. Filling in the gaps for Q3-Q4 2013 is a matter of simple extrapolation. But in order to make more effective comparisons, we also need to estimate figures for the second half of 2014. 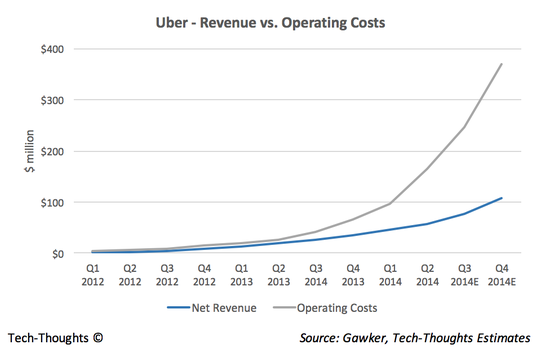 After a $258 million round of funding in mid-2013, Uber's cost base appears to have grown exponentially. This is to be expected as venture capital investors expect their cash to be put to good use. Idle money is a VC's worst nightmare. For the second half of 2014, I have assumed an acceleration in sequential revenue growth as a result of those investments. I also expect sequential growth of operating expenses to slow down as the cost base increases. This gives us the following picture for operating margin. This is an interesting chart. 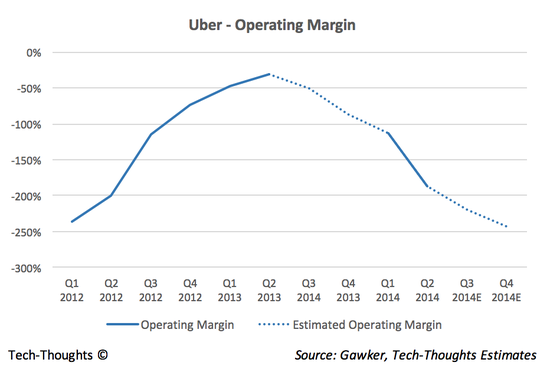 Uber's operating margin was headed in the right direction until mid-2013 as its revenue growth began slowing down. But after taking a $258 million Series-C from Google Ventures and Benchmark, Uber ploughed more money to expand its footprint (to the detriment of its operating margins). This, again, is not uncommon. VCs expect to trade off short-term margins for long-term growth. Fred Wilson recently blogged about the 40% rule, i.e. the sum of a company's revenue growth and operating margin should be roughly 40%. But in Uber's case, the sum would have been roughly -30% in 2014 (assuming my estimates are roughly accurate). On the face of it, this suggests that risk taking behavior among the investment community (at least among Uber's investors) has surpassed normal levels. This would appear to support the theory that late-stage valuations are overheating. But this still isn't conclusive without firm benchmarks. What about other tech companies that previously hit the stock market at staggering valuations? Did their financial picture look similar at this stage of their lifecycle? How Does Uber Compare to Other Tech Superstars? 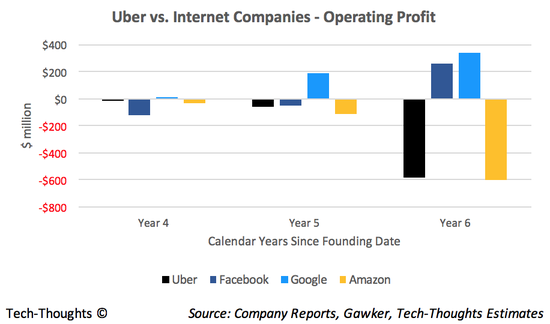 The chart above compare's Uber's revenues to those of Facebook, Google and Amazon 4-6 years after their respective founding dates. During this period, Google and Facebook were still private companies while Amazon had just hit the IPO market. Therefore, the argument that Uber has stayed private for longer doesn't quite hold water. The chart itself is eye opening. Uber's revenue trails those of its predecessors by a significant amount. 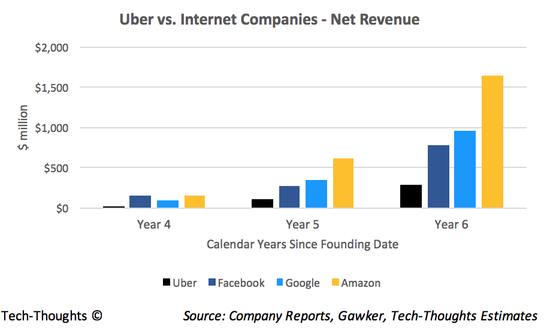 In Year 6, Uber's revenue was roughly one third of Google's or Facebook's. This is despite the fact that Uber's current valuation is ~$50 billion as compared to an IPO valuation of ~$20 billion for Google (in Year 6) and ~$100 billion for Facebook (in Year 8). What about operating profit? Google, Facebook and Amazon were investing for growth as well. Among this set of four companies, Google was the first to turn a profit in Year 5 while Facebook turned a profit in Year 6. Amazon, a company Uber has recently been compared to, did match Uber's losses as it invested for growth. But Amazon's operating losses also came from revenues that were five times larger than Uber's at the same point and growing faster. This appears to back up the theory that Uber's valuation may be a bit out of touch with its fundamentals. Some find comfort in specificity and view Uber as a "taxi booking and ridesharing app". Even Uber's website has the following description -- "Rideshare, Taxi & Taxi Alternative app". While this description is useful for today's customers, I've often found that being less specific is far more helpful to understand a product's ultimate potential. If we use that as a guideline, Uber is actually a platform connecting transportation providers with potential customers, i.e. people who need an on-demand logistics service. As of 2014, it does appear that Uber's investments and cost base is ahead of where its revenues and growth should be. However, these investments or subsidies have helped Uber create infrastructure that can be monetized in many ways. For example, excess or unused capacity from Uber cabs can be used to create an on-demand delivery service. This wouldn't necessarily be a service that immediately targets the enterprise logistics market. Rather, the untapped market for P2P logistics (e.g. an office worker who forgot his keys at home) can serve as a foothold for a market entrant like Uber. Uber already seems to be experimenting with deliveries which could create an incremental revenue opportunity without a proportional increase to their cost base. Also, this isn't a dramatically new business model. I have written about asymmetric business models before and there are numerous examples of this in play today. Flipkart in India seems to be facing a similar situation as Uber with overheating valuations and a cost base outpacing revenue growth. In response, the company has spun off their logistics arm into a separate company called eKart which will now leverage the company's infrastructure to handle deliveries for competing e-commerce companies. Therefore, the more important question in Uber's case is this: Can alternative monetization models be lucrative enough to make up for its massive valuation and infrastructure investments? I don't have an answer for that one yet.